Sainsbury’s has supported its British farmers this winter with an offer to purchase calf coats at cost price which helps to keep young herds warm and healthy throughout the winter. The retailer made the coats available to its 290 Dairy Development Group (SDDG) farmers across the UK, and farmers have taken up the offer enthusiastically, with over 850 coats ordered so far. Sainsbury’s decided to run the offer again this year after it proved so popular with farmers. By utilising the networks that already exist in the retailer’s supply chain, the supermarket has been able to offer high quality calf coats priced at only £14 each which is the cost price. 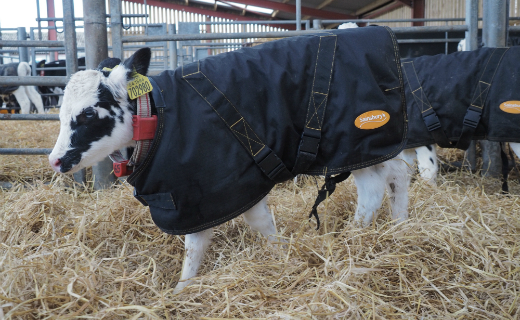 The retailer’s agriculture and general merchandising teams teamed up to source the bespoke coats, which are designed with an adjustable strap so that they can expand as the calf grows. The coats are also machine washable so they can be re-used year after year. Not only are the calf coats important for calf health and welfare, they also contribute to the efficiency of the SDDG farms. Insulation of the calves improves weight gain and ensures that the calf can use all its energy for growing, which in turn ensures that it will be less vulnerable during the winter. The SDDG was set up in 2007 to help support a long term future of the British dairy industry and we also wanted to reward the farmers that produce our milk for outstanding animal welfare and environmental standards. In 2012, a Cost of Production (COP) model was introduced to protect dairy farmers from market volatility. The model involves a set price that directly reflects their costs on the farm, building in a profit, as well as rewarding outstanding animal welfare and environmental standards. A unique element of the model is that the price paid to farmers is reviewed every three months to reflect the change in the key input costs on the farm – feed, fuel and fertiliser. The model also includes a bonus element for excellence in animal welfare standards as well as high performance in carbon efficiency.